This is a very accurate description of the contents. The book is divided into chapters containing main topics and further subdivided into particular topics. 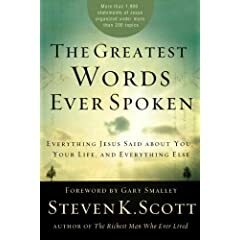 The quotes are from the New International Version and does include dialogue if there is a series where Jesus is in conversation with others. My first impression is that this is not a helpful resource. I believe that the words of Jesus are important but removing them from the rest of scripture takes away all context and does not allow for any flow of the narrative. On a more charitable note, I think that this book may be helpful as a kind of concordance – to find specific passages and look them up in context. I would not recommend this text for use without a Bible. A book with just the words of Jesus removed from their surrounding historical context? This has already been done- it’s called the Gospel of Thomas. lol.